At some science fairs baking soda volcanos can grab the blue ribbon prize. But at the International Science and Engineering Fair (ISEF), a winning project is a design to kill cancer cells. ISEF is the grand championship of science fairs, where students from around the world submit their best research projects and compete in a high-stakes, hormone-filled challenge, which is showcased in full display in the new film, Science Fair. Like any high school experience, it can be a pressure cooker of anxiety, but also a time when many students find their calling—a crucible from which our future scientists are born. Ira talks with one of the film’s directors, Cristina Costantini, and catches up with a former ISEF participant Robbie Barrat, to discuss life after Science Fair. View a trailer of the film below and find screening times and locations here. Cristina Costantini is the director and producer of the documentary film, Science Fair. 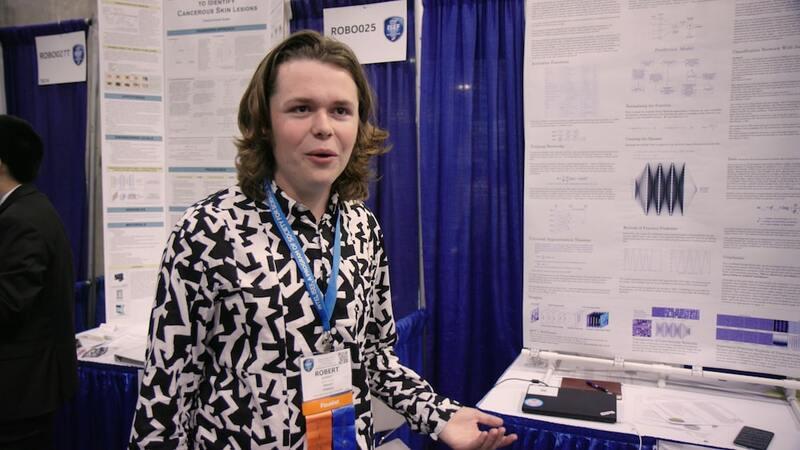 Robbie Barrat is a two-time Intel Science and Engineering Fair participant. IRA FLATOW: This is Science Friday. I’m Ira Flatow. Were you a science fair kid? I was. I remember my 11th grade science fair project. I made a little device that read punch cards. You know don’t what punch cards are. Well, if you don’t know, I really can’t tell you. But if you do, you will remember. I actually won second prize in the physics category. And I had no thoughts of ever entering one of the National Science fairs, let alone the mother of all science fairs, the International Science and Engineering Fair, or ISEF. And if you’ve never heard of it, students prepare and compete against other high schools from around the world. And the science they’re doing is way above my head. It’s really on another level. And one recent grand award winner actually developed a method of killing cancer cells. ISEF is like the Olympics of science fairs. There’s competition. There’s science geekery. Sounds like the makings of a great movie, right? Well, a new documentary aptly titled “Science Fair” follows a group of students, each one more brilliant than the last one, who set out to compete and win at ISEF. Christina Constantini is a producer and director of “Science Fair,” the new film out in theaters this week. Welcome to Science Friday. CHRISTINA CONSTANTINI: Thank you so much for having me. I’m so excited to be here. IRA FLATOW: Well, did you compete in a science fair ever? CHRISTINA CONSTANTINI: That’s right. In high school, I competed two times. And it totally changed my life. And I became obsessed with this little weird fun world of science fair nerds. And ever since I was 14 years old, I knew this would make a great documentary. And then, I became a documentary filmmaker. And so here we are. IRA FLATOW: So it was your own experience then that you drew upon. CHRISTINA CONSTANTINI: That’s exactly right. I went to a high school, like most high schools in America, that really celebrated sports. And science fair was the one place where I felt like I was really celebrated, like a football player, like a rock star. And this fair in particular is amazing. It’s 2,000 kids from around the world, from 78 different countries, some of the most brilliant minds that you’ll ever meet. But they’re also teenagers. So they’re going to dances and they have crushes and they’re also teenagers. So it’s a lot of fun. IRA FLATOW: And how far did you get when you were in ISEF? Did you actually get that high up? IRA FLATOW: That’s pretty good. CHRISTINA CONSTANTINI: Thank you. Thank you. IRA FLATOW: The movie is terrific. It’s a great film. I want to talk about how you chose the schools and the students you were going to follow. CHRISTINA CONSTANTINI: Sure. So we follow nine students from all over the world, some students from kind of the Yankees of the science fair, the teams that are well-resourced and have great coaches. So I wanted to show kind of the diversity. And my co-director, Darren Foster and I, spent a lot of time interviewing kids from around the world. But we wanted to show the Yankees, the really well-resourced schools, as well as some of the schools with less resources and some kids from backgrounds that are not as privileged. So we actually went to a tiny town in the center of Brazil. And it was a very poor town. And for them, making it to the International Science Fair was life-changing. IRA FLATOW: I want to bring on a contestant, Robbie Barrat, a former ISEF student featured in the film. Welcome to Science Friday. ROBBIE BARRAT: Hey. Thanks for having me. IRA FLATOW: What got you interested and how did you get into ISEF, into the competition? ROBBIE BARRAT: So to get to I you need to win your state fair, or a regional fair. So I got through by winning my state fair. IRA FLATOW: And you mention in the movie, you talked about you actually struggled in math in high school though. Right? ROBBIE BARRAT: Oh, yeah, yeah, yeah. Because I mean, I think my main problem with that was because math class, it’s super structured. So it’s not interesting, if it’s just like do 20 math problems or something, I’m not very good at that. But if it’s like a project, where– the first year I went to ISEF I had a number theory project. But if it’s something where I can sort of do my own pace and do stuff that I’m interested in, then I’m really good at it. IRA FLATOW: Now, I remember from my own day, back in the day when I was doing science fairs just in high school level, the competition was amazing. I mean, the pressure– I can only imagine, Robbie and Christina, what it must be like at this level. Robbie, what’s it like? ROBBIE BARRAT: Well, yeah. There are definitely some people that are super competitive, but there are also– there’s a bunch of really nice, like-minded people. And I got along with most people really well. I’m from Wisconsin. And I had no idea that this International Science Fair existed. So when I got there, I was just happy to be there, just amazed that something could exist at this scope. It’s really just incredible to see rows and rows and rows of projects of brilliant kids. It’s super inspiring. IRA FLATOW: Just want to get our listeners, if they want to tell us about their run ins with science fairs. 844-724-8255. I was also impressed by– you seemed to follow one of the teachers in the schools and how she was shepherding her classmates in there. I think she was from Jericho High School, was she not? CHRISTINA CONSTANTINI: That’s right. Yeah, Dr. Serena McCalla from Jericho, New York. IRA FLATOW: Yeah. And as someone who grew up on Long Island, I know exactly what Jericho High School is. It’s a grade school. But she spent a lot of time having her students practice their presentations. I thought that was really, really interesting. CHRISTINA CONSTANTINI: Yeah. What I loved about Jericho High School is they treat science fair like the rest of America treats football. She is an amazing coach. And she drills them over and over again. And she finds out what they’re interested in and then she reads all of the journals that she can find that are in that same area, so she can help her kids as much as she possibly can. And she’s kind of an amazing model of teaching. She’s incredible. IRA FLATOW: And one interesting aspect I thought about that is while she’s trying to teach her students how to be good at public speaking and presentation, that’s really– we talk about scientists who are researchers today, we talk about that being one of their greatest shortcomings. Yeah. That’s exactly right, I think [INAUDIBLE] says it, that part of science fair is being a good salesman. So you have to figure out how to sell your project, how to communicate ideas to experts, how to convince them that you’ve done important work. And I think they’re great life skills. I didn’t become a scientist, but many of the lessons I learned from science fair, I think I use a lot. IRA FLATOW: And Robbie what lessons have you taken away from this competition? ROBBIE BARRAT: Well, I grew up in West Virginia. So I thought that I was pretty disadvantaged. But when you go to science fair and you see all of these kids from all over, like from Brazil and from over in like lesser fortunate countries over in Asia and towards the Middle East, it really is eye opening and humbling that all of these kids have so many shortcomings and have overcome so much. But they’re competing on International Science Fair. And a lot of them have already won their national fair. So it was a bit humbling. And my perspective definitely shifted. IRA FLATOW: As someone who has not gotten into college and still looking to get into college, some of the contestants were looking at the science fair as a gateway to open up their way of getting into college. Have you been able to overcome not getting into a college? What have you been doing since graduating high school? ROBBIE BARRAT: So first of all, I really wasn’t looking at science fair as a reason to get into college. I was just doing it because it’s fun and it was an excuse for me to work on projects that I really loved. But as for what I’ve been doing outside of going to college, which I’m not, so right now, I’m working in a research lab at Stanford. I’m working at in Purvesh Khatri’s lab. It’s more biology-oriented, but I’m working a lot with artificial intelligence pertaining to that. I know he won’t brag for himself. He has an art show in Paris that’s going up. He was on the cover of Bloomberg Businessweek with AI-generated paintings. He’s guest lecturing at Stanford. He hasn’t got into college, but he’s doing incredible, amazing things. I’m not sure he needs college. IRA FLATOW: I was going to say, if you can get into ISEF and survive that a couple of times and go out on your own, maybe college is highly overrated. ROBBIE BARRAT: Well, I do really still want to go to college. As Christina said, I’m working a lot more at the intersection of artificial intelligence and art. So I’ve been thinking about going to art school. But then that is also a problem, because they don’t really offer math classes. And I need math to work in the medium of AI. So it’s a bit tricky, but I’m figuring it out. But I do still want to go to college. I’m not writing that completely off. IRA FLATOW: Tell us about one of your projects. You were there a few times. Let me bring one up. In the film, they show you demonstrating a song lyric generator. It looked kind of cool. ROBBIE BARRAT: So that isn’t my science fair project. That’s just an art project that I was doing on the side. So basically, I used neural networks, which are a sort of machine learning. But the short brief idea is, with typical programming, you think of programmers sitting down and coding rules into the computer, maybe about writing songs, like the different lines have to rhyme or whatever. But with neural networks, what happens is you can just show the neural network a bunch of data and it will figure out the patterns in that data. And then, you can use that to generate more. So in this case, the data is– I used all of Kanye West’s rap lyrics. And I sort of got the neural network to look at all the patterns in those and then generate more rap lyric. IRA FLATOW: I want to talk about one of the more interesting– I mean, not that it all wasn’t interesting– but one of the more poignant moments in the film is the time where one of the students in the film who won the top prize in her category, she didn’t have a science teacher as her mentor. She had to get her school’s football coach to sponsor her. And when she wins this top prize in her category, she’s not even recognized by her high school for winning, Christina. CHRISTINA CONSTANTINI: Yeah. I mean Kashfia’s story is one of the most heartbreaking to me. But she is a brilliant, brilliant young woman. And I think the silver lining of this story, despite the fact the high school she’s in doesn’t recognize it, there’s this figure of Coach Schmidt, who despite knowing nothing about science, he even– you know watching him try to understand what she’s done is pretty funny– but he is incredibly supportive. And so he does whatever she needs him to do in order for her project to go far. And he’s even the head of the Feminist Club at this high school. He is the head football coach, but he’s so much more, I think, to the kids who need his support. IRA FLATOW: I’m Ira Flatow. This is Science Friday from WNYC Studios. Talking about science fairs. And I’m talking about the new film. Christina Constantini, producer and director of “Science Fair.” Where can we see this film when it starts coming out, Christina? CHRISTINA CONSTANTINI: Well, it opens tonight in New York City at the Landmark 57. It will open September 21st in Los Angeles and many other cities around the country on September 28th. And if you look at ScienceFairFilm.com, you can find a screening list there. IRA FLATOW: How did you go from being and ISEF participant to becoming a filmmaker? Was it a torturous road? CHRISTINA CONSTANTINI: I was in the social sciences. So I’ve always been interested in people and how people think and why people do what they do. So it wasn’t a huge leap. But in college, I made the shift from social sciences to journalism. But I’ve still really appreciated and I’m so grateful for my experiences that I had as a high schooler in science fair. And so to me, this is a bit of a love letter to that world. IRA FLATOW: So you consider this film to be a celebration of science fairs? CHRISTINA CONSTANTINI: Exactly. Yeah. Yeah. I think they do wonderful things for kids. Whether or not kids become scientists or not, I think they teach so many important skills. And I wouldn’t be here without science fair. IRA FLATOW: Do you feel that– some people feel that it’s not right that we should treat science as a competition. It’s OK for sports or debating team, but not science. How do you respond to those folks? CHRISTINA CONSTANTINI: You know, I think, actually, Robbie in the movie says it best, which is that if you think that science fair is about winning, you’re totally missing the point of science fair. And there is a competitive nature to it. And I do think whether we like it or not, competition gets kids in the doors. I think kids are competitive. And it’s certainly part of why I did it. But in the end, I found it to be such a meaningful experience and just the exploration and innovation that comes out of these fairs is absolutely remarkable. And a lot of it is collaborative in nature. There are a lot of group projects. So I think you have competition, but you also have a ton of collaboration. IRA FLATOW: Robbie, your thoughts? ROBBIE BARRAT: I totally agree with that. I totally agree with that. I mean, if you think about science fair– if you’re just going there to compete, that’s not the point. I mean, I made a lot of really great connections at science fair. I got a bunch of really good feedback on my projects. And while people are there just to put it on their college applications, there’s a lot more that you can get out of it. IRA FLATOW: Do you think that enough people have, I guess, promoted science fairs enough? I mean, we hear about the big ISEF one. Are there enough science fairs in colleges or in high school, do you think? ROBBIE BARRAT: Well, I mean, at my high school, nobody knew about science fair. I think I was the first person from my high school to go to ISEF. But yeah, no. I mean, at least at my high school it was wildly unheard of. But that did change after I went the first time. There was like a Science Fair Club that one of the science teachers started to try and get more participation. But I feel like it definitely is something that needs more coverage. CHRISTINA CONSTANTINI: Yeah. I think the International Science Fair just lost their primary funder last year. And the Siemens Competition, which is a very big science fair, also is closing down after decades. Oklahoma State Science Fair just lost their funding. And I think we’re at a time when we need to be reminded of the importance of these kinds of programs for kids. And so part of my desire for doing this movie was to remind people just how much this means to so many kids. IRA FLATOW: That’s a good way to end it. And we’ll be hoping folks go to see “Science Fair,” opening tonight in New York and then across the country. Christina Constantini is producer and director of “Science Fair.” And Robbie Barrat is two-time former ISEF participant now working at Stanford. One last thing before we go. SciFri is here in Salt Lake City, because we’ve got a very special show planned tomorrow night at Saturday Night at the Eccles Theater Downtown. We’re going to talk about exotic organisms living in forest canopies, like my favorite, the orchids. We’ll take you along on a dinosaur dig in southern Utah. And there’s lots more. It’s going to be a great geeky evening. We’re going to conversation, science, and live music. You don’t want to miss it. There are just a few tickets left. More info at sciencefriday.com/saltlakecity. That is Saturday night. It’s going to be great, at the Eccles Theater. Be there or be square. BJ Leiderman composed our theme music. And our thanks today to KUER for welcoming us today. Michael [INAUDIBLE], Louis Downey, and Tim Slover. And a heartfelt farewell to our departing intern Lucy Wang. Today is her last day. Our thanks to her. She will be missed. Good luck Lucy. I’m Ira Flatow in Salt Lake City.